This impressive pair of lidded urns is in the style of Sevres Royal Porcelain of about 1770, Louis XVI style. Vast quantities of grand looking Sevres style ormolu mounted porcelain was produced throughout the 19th and 20th century. 99% or more was not produced at the Sevres factory. Many sellers often forget to put the word "style", so many owners believe, wrongly, they have a piece of genuine Sevres. These urns are guaranteed not to be Sevres. However, much of this impressive porcelain is of wonderful quality, and is cheaper by far than a piece from the Royal Factory. This pair of vases stands 41 cm tall and is priced at $4500, so clearly not the price of genuine Sevres! "This shade of blue, bleu céleste, was invented for the first dining service ordered by King Louis XV. Displayed for the first time at the Versailles New Years Sale in 1753. In the years and decades following, bleu céleste existed as Hellot’s most desirable and expensive invention. Although all of the eighteenth-century Sèvres ground-colors had to be somewhat affordable for the factory to produce sets and large quantities of each, all six varied slightly in price and therefore in luxury. Not only did different raw materials have to be ordered in and or imported from abroad, the chemical formulas and labor intensity varied among the ground colors. It so happens that Bleu Céleste became the most famous of Hellot’s ground colors because it was the hardest to produce and therefore the most expensive." 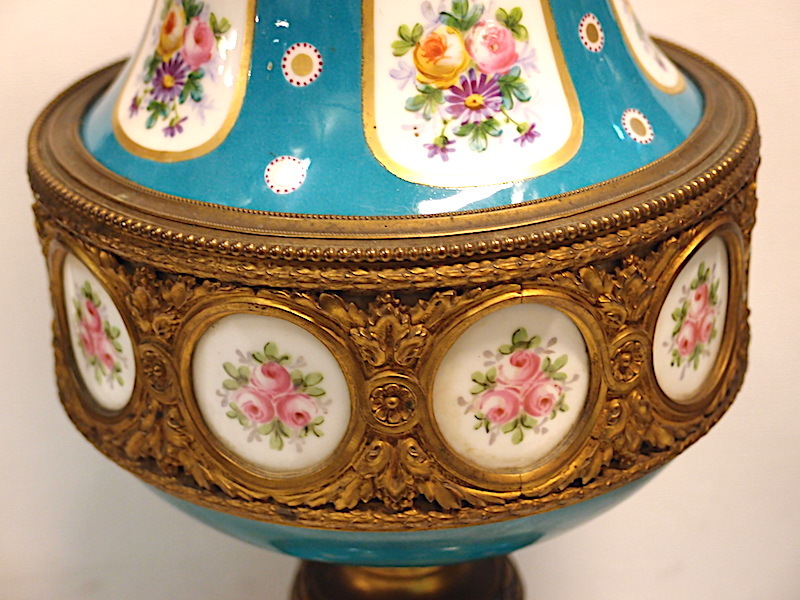 This impressive pair of lidded urns is in the style of Sevres Royal Porcelain of about 1770, Louis XVI style. Vast quantities of grand looking Sevres style ormolu mounted porcelain was produced throughout the 19th and 20th century. 99% or more was not produced at the Sevres factory. Many sellers often forget to put the word “style”, so many owners believe, wrongly, they have a piece of genuine Sevres. These urns are guaranteed not to be Sevres. However, much of this impressive porcelain is of wonderful quality, and is cheaper by far than a piece from the Royal Factory. 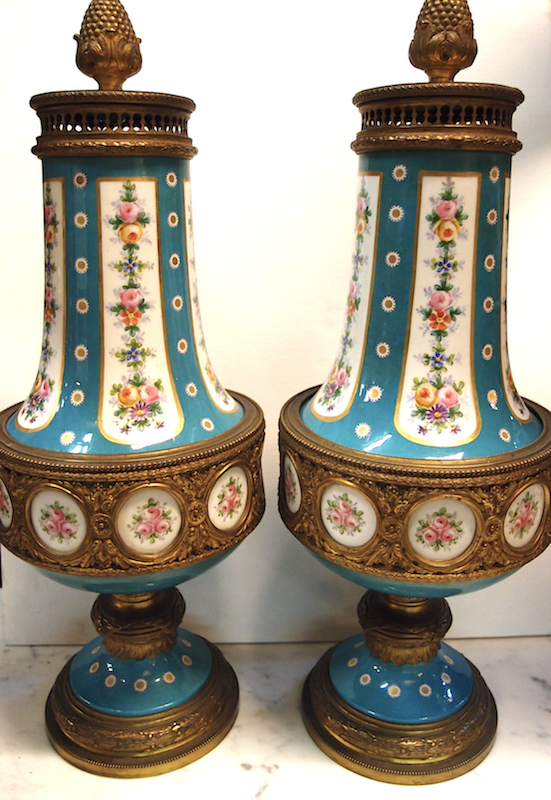 This pair of vases stands 41 cm tall and is priced at $4500, so clearly not the price of genuine Sevres!